“Earth. Love. Fire,” marks the first solo exhibition of works by Ghada Amer in the Arab world in nearly two decades. 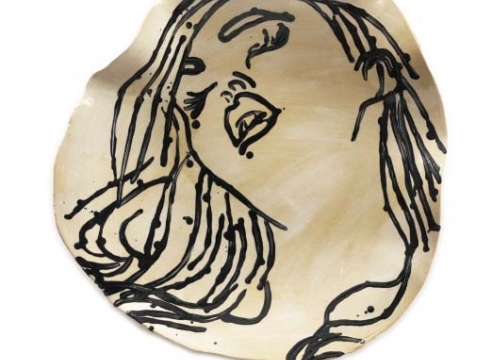 Curated by Dr. Shiva Balaghi, the exhibit will introduce Amer’s newest artistic foray into ceramics, works made during a two year residency at Greenwich House Pottery in NYC. Explaining the show’s title, Amer says, “It’s a passionate title, because I feel passionate about my ceramics.” An extension of her exploration of the sculptural form, Amer’s ceramic pieces represent the ultimate rebellion against painting as a historically male dominated artistic genre. Working against the grain of gender norms of East and West, Amer broke free from expected artistic codes. She developed her own relationship to the canvas, painting with the thread and needle. With her new body of ceramic sculptures, Amer pushes further into her formal experimentation, now painting with clay. With her canvases and her sculpture, Amer upends formal expectations, bridging the disjunction between fine art and craftsmanship. Although entirely new, the ceramic works bear characteristic marks of Amer’s oeuvre—bright colors, unexpected forms, and a sense of irony and wit. According to Balaghi “This passion, a joyous experimentation with a new medium, the playful use of color, the immersion in the materiality of clay—all of this has led to a brilliant body of work.” The exhibition will feature 28 ceramics paintings and abstract sculptures in dialogue with new paintings and Amer’s iconic stainless steel sculptures. Accompanying the exhibit will be a catalogue, produced through a collaboration between Dr. Balaghi, Adam Welch, and Ghada Amer. The book introduces readers to Amer's ceramics works by situating them within her decades' long artistic practice. Featuring scholarly essays and stunning photography, the book extends the art historical scholarship on one of the leading women artists of our generation. A bilingual book, it is published in English and Arabic. 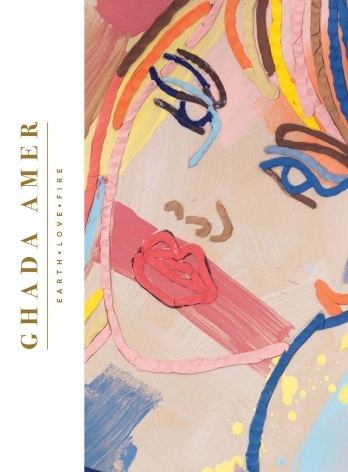 Born in Cairo in 1963, Ghada Amer received her MFA from Villa Arson in Nice, France. She lives and works in New York City. Amer’s works are part of major international public collections including Centre Pompidou, Paris; Art Institute of Chicago; Detroit Institute of Art; Mathaf, Doha; Samsung Museum, South Korea; and Guggenheim Abu Dhabi. Amer’s art has been featured in major solo and group museum exhibitions worldwide, including at the Musee d’Art Contemporain de Montreal; the Brooklyn Museum of Art; Museo d’Arte Contemporanea Roma, Rome; Gwangju Museum of Art, South Korea; and the Museum of Modern Art, New York. Her art has been featured at the Venice Biennale, the Sydney Biennale, and the Whitney Biennale. Whether working with craftsmen in Yunnan or Isfahan, Delvoye’s artistic approach has an ethnographic bent. He describes it as a form of multi-layered appropriation art, always beginning with an idea – then the materiality and design are built on a physical manifestation of that original idea. The process of art thus becomes a fusion of materials and themes. Speaking from his studio in Ghent, Delvoye explains his art stems from “a strange mix of my own personal life and larger geopolitical perspectives. Delvoye’s art blends the traditional and the contemporary. So that traditional wood craft ornament is recast into tires embellished with beautifully detailed carvings. Traditional Islamic ornamentation is recast onto metal suitcases adorned with beautiful carvings inspired by Persian metalwork. The high art of gothic architecture merges with the ordinary in scale models of industrial machinery like concrete mixers. Applying precise mathematical theories and modern computerized technology to traditional crafts, he produces beautiful objects that push the boundaries of the expected. In the process, Delvoye extends the very meaning of art itself. Born in 1965 Belgium, Wim Delvoye currently lives and works in Ghent, Belgium and Brighton, UK. His art has been the subject of numerous solo exhibitions in such international museums as Centre Pompidou in Paris, the Louvre Museum in Paris, the Pushkin State Museum of Fine Arts in Moscow, the Heydar Aliyev Center in Baku, the New Museum in NYC, and the Peggy Guggenheim Collection in Venice. Delvoye’s art is represented in major public collections worldwide. His work has been included in major group exhibitions such as Venice Biennale, Documenta IX, Sydney Biennale, Lyon Biennial, and Shanghai Biennale. Egyptian artist Ghada Amer talks of Earth.Love.Fire.